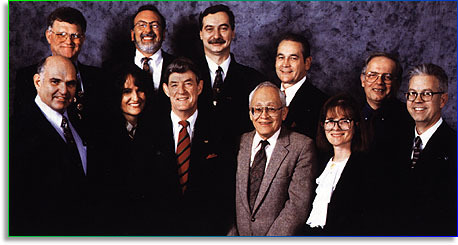 Back row: Ray Stowers, W. Kent McGregor, Vladimir Ivanov, David Root, Paolo Bruschelli. Front row: William Marcus, Shelley Beckmann, Forest Tennant, Alfonso Paredes, Megan Shields, John Duff. 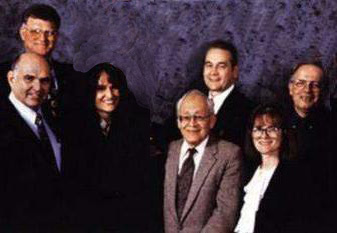 From the narcononcenter.com web page on March 3, 2000. But soon people started disappearing. By December of 2000, John Duff was cropped from the right side of the picture, and Forest Tennant was Photoshopped right out of the middle! 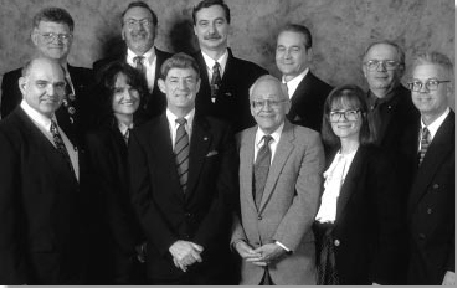 From the narconon-center.com web page on December 4, 2000. Forest Tennant and John Duff are gone. Why did Forest Tennant disappear? Perhaps it was because he was found to be running a chain of methodone clinics. That would put him strictly at odds with Narconon's teachings about drug treatment. Tennant's name appears along with Megan Shields on many of the early studies of the "Hubbard method" of drug detoxification. Apparently he decided that methadone works better. Or maybe it just pays better. Why did John Duff disappear? Duff was the President of Narconon International. But something happened, and he got cropped out of the picture. Did he perhaps leave the Scientology cult? 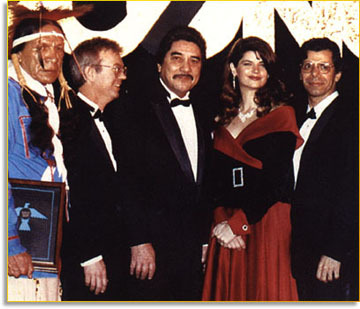 An article he wrote on Marijuana is still on the web, and here is his picture circa 1992 with William Benitez, Kirstie Alley, and some other Scientology celebrities, found on a Narconon web page in 2002. So it's not clear if he is really an "un-person" and this is an incomplete erasure, or if he was cropped for some other reason. addiction-rehabilitation.com web page on June 26, 2004. Vladimir Ivanov, Forest Tennant, and John Duff are all gone. Why did Vladimir Ivanov disappear? 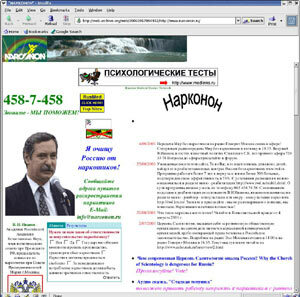 Ivanov brought Narconon to Russia, and was the creator of www.narconon.ru. In 2001 he had a change of heart and declared Narconon/Scientology to be a "Satanic cult". He even went so far as to use the narconon.ru web site to attack Scientology. In the screen capture below you can see the question, "Why the Cherch [sic] of Scientology is dengerous [sic] for Russia? Vote!" 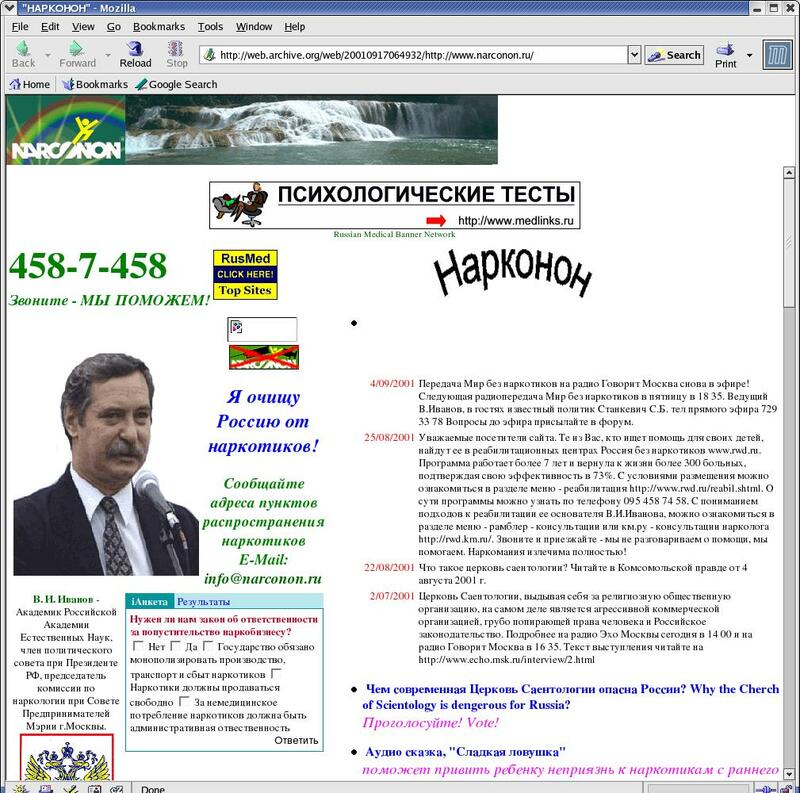 Vladimir Ivanov denounced Scientology on his narconon.ru web page in June 2001. HaPKOHOH is "Narconon" in the Cyrillic alphabet. Why did Kent McGregor disappear? McGregor, while at CARF, got Narconon their bogus certification. He later left the US after losing a court judgment in a sexual assault case (and not paying). Years later he settled with the plaintiff and is currently living again in the US, married to a Scientologist and fellow Narconon staffer. In the 2002-2004 time period they were working at Narconon Arrowhead. Read more about Kent McGregor's illustrious career. Winston did not know why Withers had been disgraced. Perhaps it was for corruption or incompetence. Perhaps Big Brother was merely getting rid of a too-popular subordinate. Perhaps Withers or someone close to him had been suspected of heretical tendencies. Or perhaps -- what was likeliest of all -- the thing had simply happened because purges and vaporizations were a necessary part of the mechanics of government. The only real clue lay in the words 'refs unpersons', which indicated that Withers was already dead. You could not invariably assume this to be the case when people were arrested. Sometimes they were released and allowed to remain at liberty for as much as a year or two years before being executed. Very occasionally some person whom you had believed dead long since would make a ghostly reappearance at some public trial where he would implicate hundreds of others by his testimony before vanishing, this time for ever. Withers, however, was already an unperson. He did not exist: he had never existed. Did you ever read poor old George Orwell's uh.. 1984? Yes, yes, that's wonderful. That would be, could be, the palest imagined shadow of what a world would be like under the rule of the secret use of Scientology with no remedy in existence. Why won't they let Alfonso Paredes disappear? Dr. Alfonso Paredes is professor emeritus of psychiatry at UCLA, and is not happy that Narconon is still using his name. Paredes was hoodwinked into an affiliation with Narconon when the cult offered to fund him to conduct a study of its effectiveness. That funding never came through, but Narconon continues to trade on Paredes' reputation. He cannot retaliate because his son is a Scientologist, and family relations are already strained because of Scientology's antipathy towards psychiatry.